You just can’t go past a light display for creating ambience outdoors. Paper lanterns are both colourful and practical. They can be used to ‘cover’ small candles for an evening event, or cover vases of flowers by day. They look best, however, strung up over your table, with or without illumination, looking just as pretty as decoration for a luncheon as they will after dark emitting a soft colourful glow over the dinner table. If outside in the evening, put up an umbrella and tie the paper lanterns to the ribs inside, or hang fairy lights or small glass hurricanes to create a private starry dome of twinkling candles. 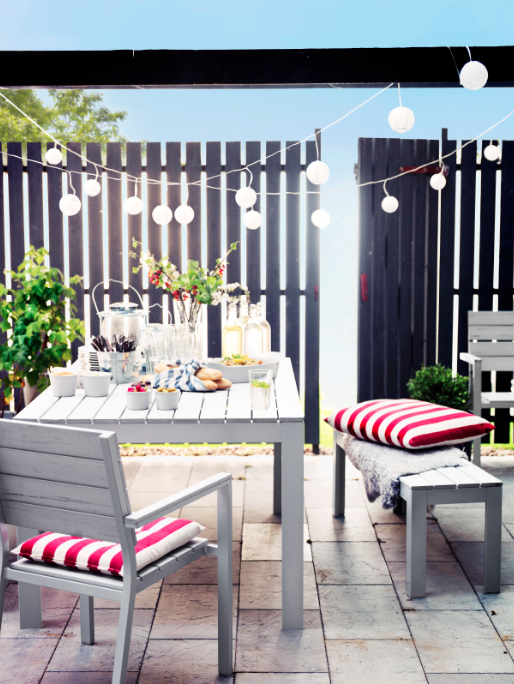 Create an outdoor party ambience with pretty Strala snowball lights from Ikea.